Offprint Collection of Emmett L. Bennett, Jr.
A portion of our collection has been digitized and is available online. Our online holdings currently include the correspondence from the collections of Michael Ventris, Alice Kober and Emmett L. Bennett, Jr. These documents are available at the Texas ScholarWorks (TSW) Repository website. Archives of Emmett L. Bennett, Jr. THE PASP Archives houses the papers of Emmett L. Bennett, Jr., one of the world’s most distinguished and reputable Classics scholars and the founding father of the study of Mycenaean scripts. His systematic and meticulous analysis of Linear B was instrumental in its decipherment by British scholar Michael Ventris in 1952. During the 2006-2007 academic year, M.S.I.S. candidate Christy Costlow of the University of Texas at Austin’s School of Information arranged, indexed, and rehoused the materials into archival enclosures. The collection, consisting of 6,193 items, is comprised of the research material, publications, manuscripts, lecture notes, education and teaching material, correspondence, and photographic material created and compiled by Bennett during his professional career. The bulk of the material include items related to the study of Linear B and Bennett’s correspondence with other scholars and colleagues in the Classical Studies field. Bennett was a passionate scholar whose extraordinary precision and attention to detail are well illustrated by the numerous grids, graphs, and statistical calculations he completed in his work on Linear B. His roles also included those of a mentor, encourager and collaborator, and as a reputable and greatly respected scholar in the field, Bennett received frequent correspondence and papers for review from colleagues and amateurs alike. 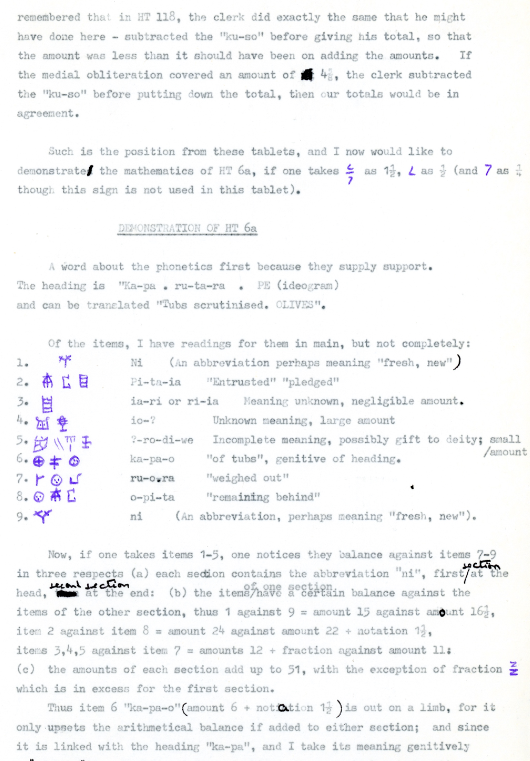 Prior to and around the time of the decipherment of Linear B, Bennett collaborated closely with Michael Ventris (these letters are included within PASP’s Michael Ventris archival collection), and for years afterwards he remained close with those such as Carl Blegen, his former teacher, and John Chadwick, a frequent collaborator. Bennett donated the materials to PASP under the custody of Prof. Palaima. Related materials are found in PASP’s collections of the papers of Michael Ventris and Alice E. Kober. Additionally, PASP houses the offprint collection of Emmett. L. Bennett, Jr., also given to Prof. Palaima who retains ownership. The Emmett L. Bennett, Jr. Offprint Collection of the Program of Aegean Scripts and Prehistory (2,500 items) is comprised of the research material, publications, manuscripts, correspondence, and photographic material created by many Mycenaean scholars and sent by them to Bennett in the course of his Editorship of the journal Nestor, which he founded in 1957. The collection consists of two groups: Bennett Offprint Collection, up to 1995; and Bennett Offprint Collection, 1995-2011. The bulk of the material includes items relating to the study of Mycenae and Linear B, and Bennett’s correspondence with other scholars and colleagues in the Classical Studies field. The Offprint Collection was processed, arranged and described by archivist Sarah A. Buchanan between August 2013 to October 2015. 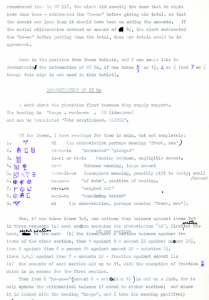 THE PASP Archives include primary source materials of early researchers in Linear B such as Alice Kober and Michael Ventris. The Ventris material consists mainly of letters that Mr. Ventris sent to Emmett L. Bennett, Jr. and Alice E. Kober, and photocopies of correspondence with Sir John Myres (courtesy of the Ashmolean Museum in Oxford). A pilot project to digitize selected letters of Ventris is now underway in cooperation with the Digital Library Services Division-Digitization Center of the General Libraries. PASP thanks Mark McFarland, Chad Hutchens, Uri Kolodney, Aaron Choate, Maria Esteva, Sue Trombley, Stephie Nikoloudis and Kevin Pluta for their participation in this project. Funding has come from the Institute for Aegean Prehistory and the Dickson Centennial Professorship. As of October 2017, material from the Ventris Collection is being digitized for online access through University of Texas Scholarworks. This material will start appearing online by December 2017. The Ventris materials have long been stored in acid-free conditions and the paper on which most of the letters were written, in Ventris’ elegant architectural hand, was of good quality and the ink is still strong. During academic year 2003-2004, the Kober materials were professionally indexed and archived, and stored in better conditions for preservation, by Sue Trombley of the School of Information here at UT Austin. The major part of the Kober collection consists of ca. 186,000 ‘cigarette-carton’ note cards, each hand cut from notebook and other kinds of paper. Ms. Kober used different inks as she edited the dense notes on each card. Some of the fountain pen ink is now badly fading. It is in great need of digitizing, since scholarly interest in Ms. Kober’s work has increased following the anniversary of the decipherment of Linear B in 2002 and the inevitable comparison of Ms. Kober’s contribution to it and that of Rosalind Franklin to the discovery of DNA. PASP is also fortunate to keep photocopies of Ms. Kober’s correspondence with Sir John Myres (courtesy of the Ashmolean Museum in Oxford), photocopies of the correspondence of Arne Furumark with Ventris (courtesy of the University of Uppsala), and Ms. Kober’s offprints and unpublished scholarly papers and drafts. Ms. Kober gave this material to Emmett L. Bennett, Jr. in the months preceding her death and instructed her brother to give the remaining materials to Prof. Bennett. Professor Bennett gave these materials to Prof. Palaima who retains ownership of them. PASP also houses the offprint collection of Emmett. L. Bennett, Jr., likewise given to Prof. Palaima who retains ownership, as well as valuable works of scholarship with annotations by such figures as the late Leonard R. Palmer, purchased by Prof. Palaima. The Elizabeth Wayland Barber collection consists of scholarly materials related to Linear A, including research data from her dissertation and college thesis. The collection includes manuscripts, bound theses, and scholarly publications (monograph and offprints). Dr. Barber joined the faculty of Occidental College in 1969 where she taught such subjects as basic linguistic structure, language and the brain, historical and archaeological linguistics, Neolithic and Bronze Age Old World archaeology, ancient Greek, and first-year writing. She was made professor emerita in 2007. Barber is the author of several books. These include Archaeological Decipherment: A Handbook (1974), Prehistoric Textiles: The Development of Cloth in the Neolithic and Bronze Ages with Special Reference to the Aegean (1992), Women’s Work: The First 20,000 Years; Women, Cloth, and Society in Early Times (1995), The Mummies of Ürümchi (2000), When They Severed Earth from Sky: How the Human Mind Shapes Myth (2006, coauthor with Paul T. Barber) and The Dancing Goddesses: Folklore, Archaeology, and the Origins of European Dance (2013). At the time of donation of her Linear A archive to PASP (in 2013, in part from reading Margalit Fox’s book on Alice Kober), Dr. Barber lived in Pasadena, Calif. Dr. Barber enclosed several copies of her articles on textiles for distribution to Lydia G. Neuman, then a graduate student in the M.S. Textile and Apparel Technology program at UT; the archivist kept a copy for this collection. The second accrual of this collection was donated by Barber to PASP in March 2014. It consists of the two computer tapes described above, a tape by Murray Fowler and Wolfe of the Etruscan alphabet, and eight books from Barber’s personal Mycenaean Library. Of note, Fowler and Wolfe’s Materials for the study of the Etruscan Language (v.I-II, 1965) detail the creation of the computer tapes. The Barber Collection was processed by archivist Sarah A. Buchanan between September 2013 to April 2014. The materials of Jeremiah “Jerry” Egbe Ifie represent his research as a professor of classics at the University of Ibadan, Nigeria and as a Visiting Professor at the University of Texas at Austin. The collection includes scholarly publications (offprints), correspondence, course materials, cassette tapes, and monographs. Jeremiah “Jerry” Egbe Ifie (April 22, 1942 – December 16, 2004) was a Classical scholar, poet, and playwright who collected myths from Izon land in Nigeria and researched the culture, literature, and languages of the Nigerian people. As Senior Lecturer (since 1982) at the University of Ibadan, Department of Classics, Ifie taught the history and myths of the Izon and the Urhobo peoples as well as Greek and Roman Historiography, Drama, and Philosophy. In 1996 and 1997, Ifie was a Visiting Professor at the University of Texas at Austin, Department of Classics (then chaired by Dr. Thomas G. Palaima, who extended him the invitation), teaching Classical and African Mythology and Beginners Latin. An ancient historian by training, Dr. Ifie studied the culture, literature, and languages of his people, the Izon and Urhobo, and published several articles on Romano-African history. He was known as a specialist in the Roman Empire in North Africa, Classical and African mythology, the anthropology of native African cultures, and Izon poetry, literature, myth, and religion. His A Historical Background to the New Testament discusses Greco-Roman societies between 320 B.C. to about 140 A.D. Dr. Ifie’s work as a playwright includes the original works The Paradise of the Mother (1988), and the three-part Ayabare / Obaro / Enimuaketa, Don’t Kill My Mother (1992, 92, 94), which were staged at the Arts Theatre, University of Ibadan. As Egbe Ifie, he was a published poet, creating several collections of poems and epigrams in Izon and English. The Ifie collection was processed in June of 2013 by archivist Sarah A. Buchanan. Additions to this collection were made in August 2017 to include two of Dr. Ifie’s published works, A Garden of Dreams and Don’t Kill My Mother (Part II). The William C. Brice collection of scholarly materials relates to Linear A and Brice’s editorship of the journal Kadmos. The collection includes Minoan research manuscripts and notes, scholarly publications (monographs and offprints), photographs, and correspondence. Correspondence includes a letter from Michael Ventris to Brice discussing Scripta Minoa III . William Charles Brice (July 3, 1921-July 24, 2007) was a linguist, archaeologist, ethnographer, and geographer, as well as a polymath. In 1939, he won an open scholarship in geography at Jesus College, University of Oxford and enrolled just as war broke out. In his second year there in 1941, having completed officer training, he was called to duty as a full-time officer trainee in Dunbar. William matriculated to Oxford for the January 1946 term and received a First Class B.A. and M.A. in Geography that June. William’s desire to return to the Far East was encouraged by his Oxford ethnology teacher, (Sir) John Myres, and William was soon accepted by Professor John Garstang (Liverpool University) to join archaeological excavations in eastern Turkey, for a year during 1946-47. William excavated at the Neolithic site of Yumuk Tepe (Mersin), and at the Roman frontier site of Antioch with Sir Leonard Woolley in the spring. William developed a love of travel, and in addition to his impressive sketching abilities, he was a fluent speaker of Turkish, Punjabi, Urdu, Arabic, French, and Hindustani. From 1955 to his retirement in 1982, William was an esteemed professor in Middle Eastern Geography at Manchester University. Among his publications in this area were South-West Asia (1967), The Environmental History of the Near and Middle East Since the Last Ice Age (1978, as editor), and An Historical Atlas of Islam (1981). William was known as a soft-spoken gentleman among his colleagues; influenced by a Persian friend, William refrained from drinking and swearing throughout his life. William also gave lectures and advice within the Muslim community, and was an avid swimmer, cyclist, Morris dancer, musician (banjo and piano accordion), and Punch and Judy puppeteer. William was a generous scholar, and he oversaw the posthumous publication, in 1980, of Terence Mitford’s The Nymphaeum of Kafizin. Owing to his work on linear Aegean scripts, in 1962 William was asked to join the founding editorial board of Kadmos, a new journal dedicated to study of the earliest inscriptions from Greece and the Aegean. William was subsequently asked to edit the journal in 1968; he would hold that post for 24 years, writing not only many short announcements of epigraphical discoveries but also articles on Linear A and Cretan Hieroglyphic. Research notes, manuscripts, drawings, publications, glass slides, negatives, and photographs are included in the 1615+ items that comprise the William C. Brice Collection (1908-2006) of the Program in Aegean Scripts and Prehistory. The collection material was processed by archivist Sarah A. Buchanan in June 2014. As of October 2017, the correspondence of the William C. Brice collection are being scanned for upload at Texas Scholarworks. A great batch of these correspondence document the efforts in publishing Scripta Minoa III after the death of Sir John Myres. Brice attempted to publish work on Linear A in Scripta Minoa III but was ultimately met with refusal. Scripta Minoa III would never be published and the project was cancelled following Myres’ death. Many notable correspondents make up this collection material. Included are letters exchanged between Brice and noted archaeologists like Sinclair Hood and Leonard Woolley, historian Mortimer Wheeler, Sir John Myres, Emmett Bennett, Michael Ventris, and John Chadwick and many others. The Brice correspondence will be made accessible with all the standards of our material online at the University of Texas Scholarworks (TSW). Currently, letters are being scanned and processed and these files are being given metadata elements for their eventual ingestion to TSW. Brice correspondence will begin to appear online by December 2017. PASP is pleased to announce the acquisition of the collection of Linear B paintings by artist Nikolaos Samartzidis. These paintings exhibit the original poetry of Samartzidis from Greek to Linear B and also the adapted translations of modern poets like Elytis, Papadiamantis, Cavafy and ancients like Homer. They emulate the recovery of Linear B tablets, representing fractures, joins, and script. Samartzidis was born in northern Greece and started painting when he was twelve years old. He has spent a lifetime in the study of painting and poetry. Since 1990, he has lived in Ruesselsheim am Main in Germany. His paintings have been exhibited in Crete and Germany. As of October 2017, this collection is being processed for long term preservation and access by PASP. A selection of paintings will be uploaded to TSW by November 2017. We then plan to curate the TSW collection objects online using the platform Scalar. There, high-resolution photographs of all of PASP’s Samartzidis collection will be presented with translations of each work. This work is being prepared to be completed by the Spring of 2018. The proceedings from the CIPEM 2000 conference have been archived at PASP. The finding aid to this material can be located at the URL below. The CIPEM 2000 papers are a collection of scholarly materials relating to Mycenological studies covering subjects like Linear A, B, and Cypro-Minoan script and culture. The papers were presented at the 11th International Mycenological Colloquium at the University of Texas in 2000 by the leading scholars in the field. The Papers collection consists of articles, article proofs, programs, correspondence, 3.5” floppy disks and compact disks. It also contains 8 cassette tapes of recorded Question and Answer sessions after each participant’s presentation. These cassette tapes have been digitized and are available on only request. They are accessible in MP3 format and a program with time-stamps has been created for navigating these files. The recordings omit the presentation of papers and focus on the Q&A which followed. Scholars like Emmett Bennett, Anna Morpurgo-Davies, Yves Duhoux, Jose Melena, C. J. Ruijgh, and Tom Palaima can be heard voicing their thoughts on the presentations, offering criticisms, and taking questions from the very brightest of the Mycenological community. This collection was processed and digitized in August 2017 by Garrett Bruner.